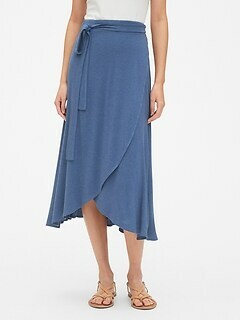 Explore the latest collection of women's long skirts at Gap. A long, flowing skirt can add dramatic impact to some of your most time tested ensembles, and you can establish and expand your signature look with the newest arrivals at Gap. Explore easy to integrate silhouettes, such as wrap skirts, pencil skirts, and tie belt skirts, and give your look an instant upgrade. Choose from midi styles in attractive materials such as linen and cotton that give your ensemble a perfectly feminine feel. These inspired long skirt designs offer that alluringly breezy look that makes an impression the moment you step into a room. They are finished with details such as embroidered accents and ruffled trim that give an ordinary outfit a little extra. Give your regular rotation a welcome dose of flair with the stylish selection of long skirts now available at Gap. 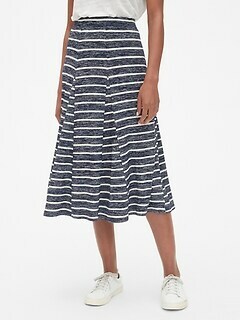 With the exclusive assortment of long skirts for women now in stock at Gap, you can create an array of memorable looks from the workplace to the weekend. Making these effortlessly elegant designs work for you is as easy as pairing a long skirt, featuring a distinctive embellishment such as fringe or an asymmetrical cut, with an oxford style button front shirt in a classic white color. Add a pair of your favorite wedges for an easy look that feels entirely put together. For an everyday office look, try teaming a midi in a floral print with a chic top in a coordinating shade, then layer it beneath a lightweight blazer for a professional finish. Arrive with added height and drama by punctuating the look with a pair of stilettos, or adjust it for a chillier day by slipping into a cute pair of booties. These garments can also be a natural option for casual wear. Top a midi skirt off with a baby tee showcasing a vibrant graphic design for a laid back look that still makes an unmistakable statement of personal style. 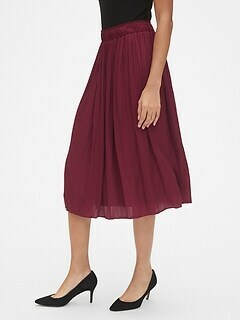 Build a fun wardrobe of options for any venue with your picks from the newest collection of midi skirts in stock at Gap.